Paris-based Atelier 37.2 recently built a habitable sculpture right on the slope of an extinct volcano. Named Sloping House, the project was built entirely from untreated, recycled wooden boards in Puy de Serveix, in France’s Massif Central. It’s shape starts with a simple archetypal house and develops into an explosion of wood, resembling a fiery erupting volcano. Atelier 37.2 is a micro-architecture studio formed by Italian architect Francesa Bonesio and Art Director and Philosopher French Nicolas Guiraud. Their work is centered on the relational and narrative potential of space and they firmly believe in the psychological and spiritual power of architecture. For their Sloping House, designed for this year’s Festival Arts Nature in Auvergne, France, they focused their design on the user’s experience. 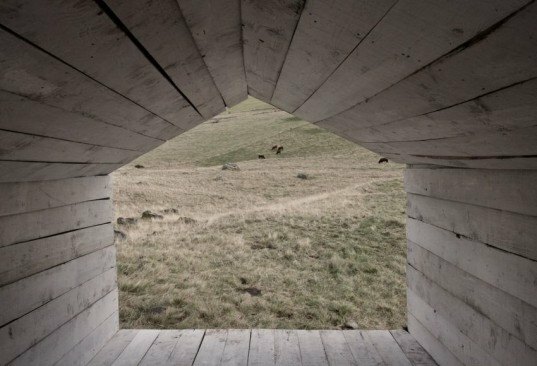 The scrap wooden shelter offers visitors a tranquil space to retreat from the world relaxing over a calm volcano. A sculptural one-person refuge, the dwelling’s angled position forces visitors to recline, relax and contemplate the peaceful French landscape. A piece of micro-architecture, a habitable sculpture or a mountain refugee rest stop, Atelier 37.2’s Sloping House inspires tranquility on a once no-so-tranquil mountain slope. Atelier 37.2 is a micro-architecture studio formed by Italian architect Francesa Bonesio and Art Director and Philosopher French Nicolas Guiraud. Their work is centered on the relational and narrative potential of space and they firmly believe in the psychological and spiritual power of architecture. For their Sloping House, designed for this year’s Festival Arts Nature in Auvergne, France, they focused their design on the user’s experience. 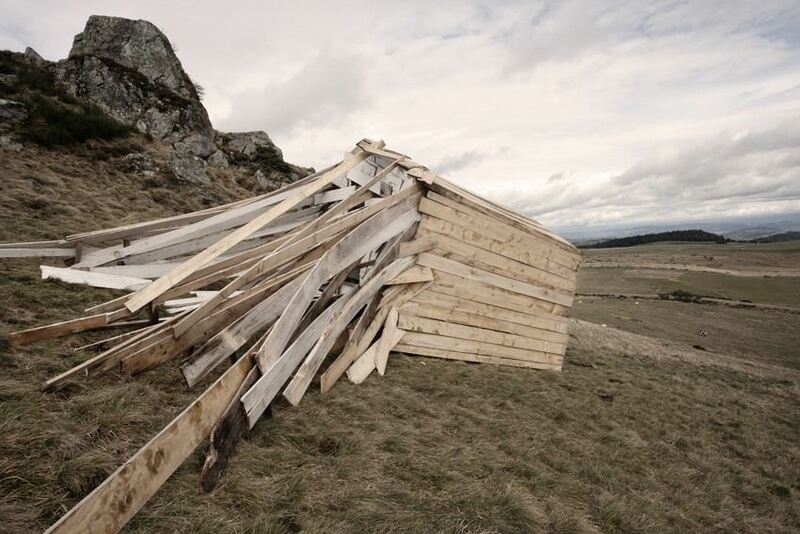 The scrap wooden shelter offers visitors a tranquil space to retreat from the world relaxing over a calm volcano. A sculptural one-person refuge, the dwelling’s angled position forces visitors to recline, relax and contemplate the peaceful French landscape. A piece of micro-architecture, a habitable sculpture or a mountain refugee rest stop, Atelier 37.2’s Sloping House inspires tranquility on a once no-so-tranquil mountain slope.